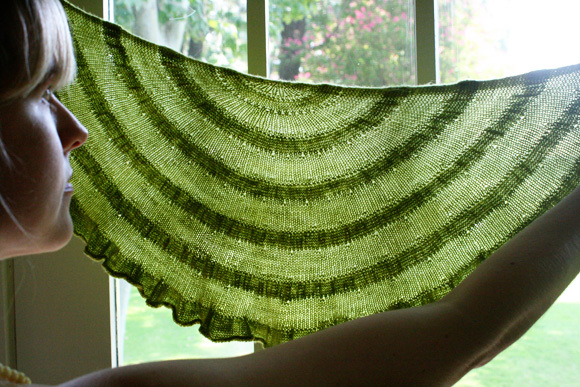 Shawls are one of my favourite projects to knit on, because most use just one skein of sock yarn, which means they are portable and lightweight (ideal summer knitting). This month's KAL is a very simple pattern with a delightful result. Say hello to Citron! The pattern for Citron is available free from Knitty. As a reminder, our CAKAL (that's Crochet-and-Knit-a-long) groups meet Sundays form 1-4pm, though of course you're welcome to bring your project in on Tuesdays or Fridays. Citron is GREAT knitnight knitting because it's mostly just plain stocking stitch, with just enough of a pattern to mark progress and keep things interesting.